For the last month or so, a few friends have been quoting this television show, Letterkenny, nonstop. They do this a lot with shows they enjoy even though it makes no sense to the rest of us. But they’ve recommended some quality shows in the past (like Rick & Morty), so after what seemed like the 100th quote, I decided to give it a try. 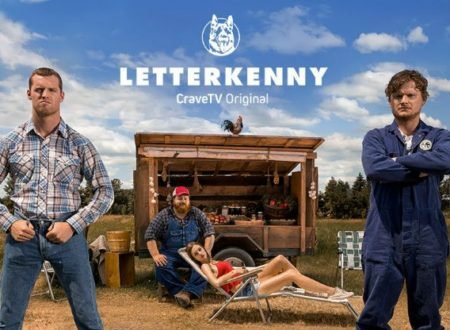 Letterkenny isn’t particularly easy to find in the US, though, because it’s a Canadian show. I had to sign up for Hulu to get the first 2 seasons. Right away, I was hooked. The show is written in a way that is unlike any other show I’ve watched. The dialogue is super quick, and almost every sentence is a punchline. They’re hit and miss, but the sheer quantity results in quite a few laughs per episode. The setting is a small Canadian town called, of course, Letterkenny. The show highlights various types of people in the town: farmers, hockey players, churchfolk, goths, etc. The main characters are farmers (a sister, brother, and his two friends), but the show spends time with all of the different characters. I don’t really get the humor of the goths and sometimes fast forward through their scenes, but the rest of the people are entertaining and weird. I’m sure the humor isn’t for everyone. Not only is it fast, but it can be sexual, crude, specific, and full of slang that is never explained–you either catch on to it or you don’t. My hope is that Hulu picks up the other 3 seasons soon, as I’d really like to watch more Letterkenny. This entry was posted on Monday, August 13th, 2018 at 9:51 pm	and is filed under television and tagged with television. You can follow any responses to this entry through the RSS 2.0 feed. Holy crap, that was funny. Season 3 can be found on Dailymotion, I’ve managed to get a few of my co-workers into the show as well. I’ve also adopted a few quotes into my daily lexicon. I haven’t enjoyed a show this much in a long time. Milking the prostate… oh, my!